MCC Acting CEO Jonathan Nash, left, and Côte d’Ivoire Minister of Economy and Finance Adama Koné, right, sign the Côte d’Ivoire Compact with Acting Principal Deputy Assistant Secretary of African Affairs Stephanie Sullivan and Côte d’Ivoire President Alassane Ouattara on Tuesday, Nov. 7, 2017, at the U.S. Department of State in Washington, D.C.
MCC Acting CEO Jonathan Nash, left, and Côte d’Ivoire Minister of Economy and Finance Adama Koné shake hands after signing the Côte d’Ivoire Compact with Côte d’Ivoire President Alassane Ouattara on Tuesday, Nov. 7, 2017, at the U.S. Department of State in Washington, D.C.
MCC Acting CEO Jonathan Nash delivers remarks prior to signing the Côte d’Ivoire Compact on Tuesday, Nov. 7, 2017, at the U.S. Department of State in Washington, D.C.
Côte d’Ivoire President Alassane Ouattara delivers remarks prior to signing the MCC Côte d’Ivoire Compact on Tuesday, Nov. 7, 2017, at the U.S. Department of State in Washington, D.C.
WASHINGTON, D.C., November 7, 2017 – The U.S. Government’s Millennium Challenge Corporation (MCC) and the Government of the Republic of Côte d’Ivoire today signed a five-year, $524.7 million compact to spur economic growth and reduce poverty in Côte d’Ivoire, supporting regional stability and new business opportunities. 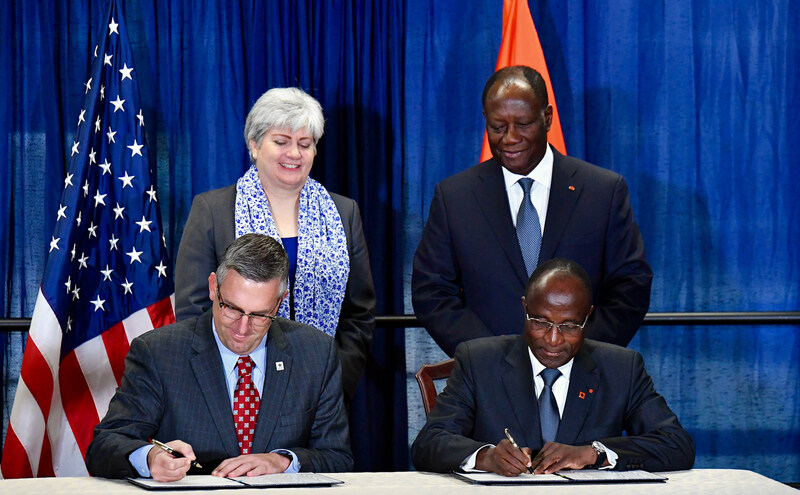 Côte d’Ivoire President Alassane Ouattara and MCC Acting CEO Jonathan Nash joined Acting Principal Deputy Assistant Secretary of African Affairs Stephanie Sullivan at the U.S. Department of State in Washington, D.C., for the signing ceremony. 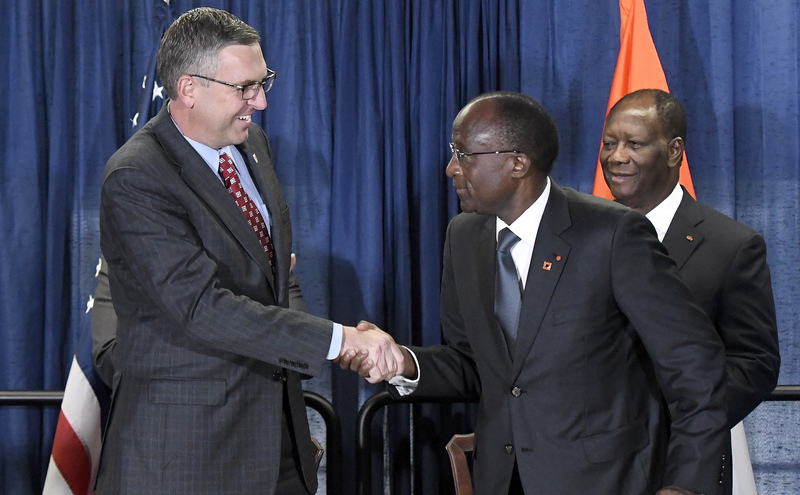 MCC’s compact with Côte d’Ivoire is designed to support growth and private investment by building workforce capacity, reducing transportation costs, and opening new markets. 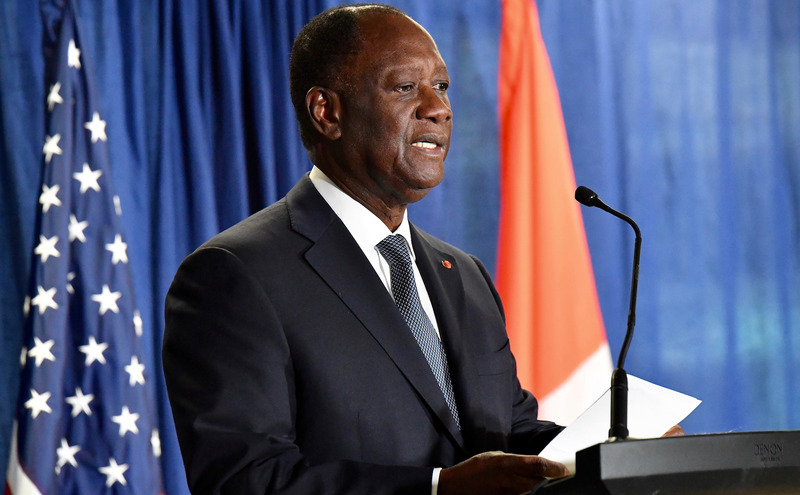 The Government of Côte d’Ivoire is expected to contribute an additional $22 million to support the compact program. A regional economic hub in West Africa, Côte d’Ivoire struggled with political instability and economic decline throughout the 1990s and 2000s. Since 2012, political stability has allowed the economy to recover from years of stagnation, with the country now averaging a nine percent increase in GDP growth in each of the past five years. Despite this recovery, the country still has unmet goals in poverty reduction and remains dependent on a narrow set of exports. Approximately 40 percent of Côte d’Ivoire’s population is under the age of 14, and many young Ivoirians don’t finish secondary school. 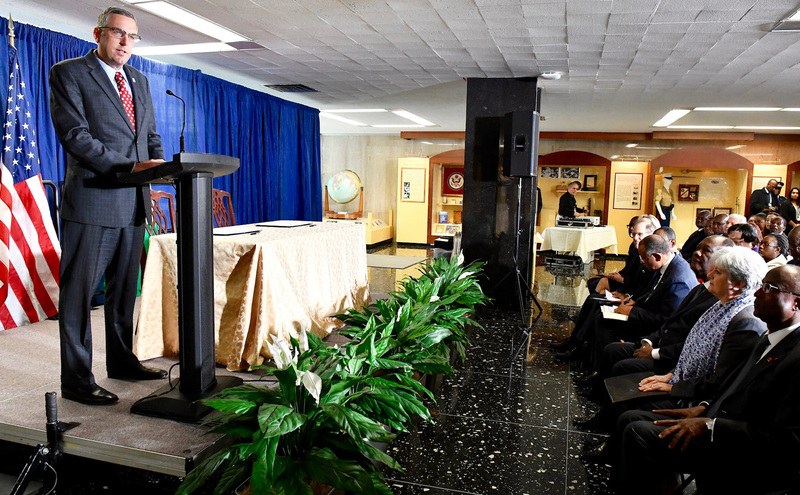 To meet the employment needs of the private sector and strengthen workforce capacity, MCC’s investment will focus in part on expanding education and in-demand skills. The Skills for Employability and Productivity Project will increase access to secondary education and teacher training, and support the construction of up to 84 new secondary schools. Through a public-private partnership, a new technical vocational education and training (TVET) model will advance development of in-demand skills. It will also help the government mitigate gender disparities, improving outcomes for girls in the education system. MCC’s investments in transportation are designed to facilitate trade, open new markets for goods, and create new business opportunities. The Abidjan Transport Project will reduce transport costs and improve efficiencies for businesses by rehabilitating roads in and around the port area and improving road network management and maintenance. The Côte d’Ivoire Compact was jointly developed by MCC and the Government of Côte d’Ivoire to address two of the most significant constraints to growth in the country: low availability of skilled workers; and challenges to moving goods and people, especially in Abidjan, the nation’s economic capital. After passing only five of 20 policy indicators in 2013, the Government of Côte d’Ivoire adopted MCC’s scorecard as its roadmap for reform and established an inter-ministerial committee to develop and implement those reforms. After Côte d’Ivoire passed MCC’s scorecard in 2015, MCC’s Board of Directors selected the country as eligible to develop a compact. The country’s concerted effort demonstrates the impact MCC’s model and scorecard have in driving policy change globally even before a dollar of taxpayer money is spent, often called “the MCC effect”. 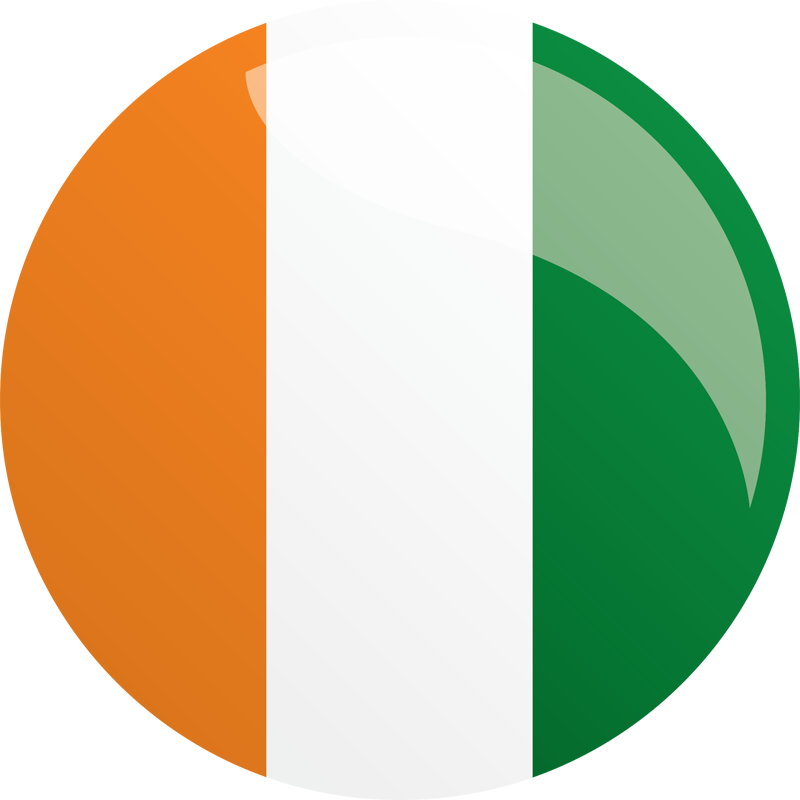 New procurement and business opportunities associated with the Côte d’Ivoire Compact will be announced in the coming months. Visit the Work With Us section of MCC’s website to learn more: www.mcc.gov/work-with-us.